The Melbourne House Hotel is now taking bookings for a range of functions and events. Our two beautifully decorated dining rooms together with our modern bar area can accommodate up to 70 guests and is the ideal venue for christening celebrations, birthdays, engagements, in fact any occasion. We have a range of buffet menus to choose from and can arrange those little extras to make your event extra special, such as chair covers and sashes, balloons and much more. The hotel benefits from a fully licenced bar which offers a wide range of beers, wines and spirits at fair and sensible prices. 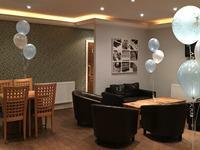 Our function facilities also have full disabled access together with designated disabled toilet facilities. *We also take bookings for funeral wakes during the day. Booked this hotel whilst working away for work.